One of most popular archive types now supported on your BlackBerry smartphone! 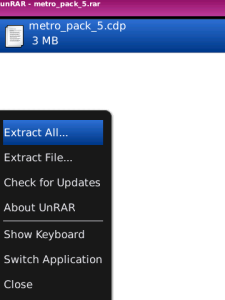 If you receive e-mail with RAR file in attachment or transfer RAR files from PC to your BlackBerry smartphone, you can extract all or selected files using unRAR on-the-go. Just open RAR file in a file browser, and select Extract All and you are there! If you buy unRAR now, you will have free access to all future updates. The unRAR software seems to be old or discontinued. If you need more information please contact the developers of unRAR (Almoko), or check out their product website.